Shown here is both the MOSSAR & KSSSAR Color Guard Teams, who participated at the Roots of a Nation Exhibit at the Midwest Genealogy Center in Independence, MO on Friday, July 8, 2011. This was a private showing with 120 people attending. The Roots of a Nation Exhibit at the Midwest Genealogy Center, marks the first one in the Midwest, where Claude and Inez Harkins Freedom Collection of artifacts are on display and free to the public from July 9 - August 21, 2011. Visitors are encouraged to take away a better appreciation for our Founding Fathers and the sacrifices they made during the Revolutionary War, in order to give us the freedoms that we have now. Mr. Claude Harkins is a KSSSAR DX Chapter member. 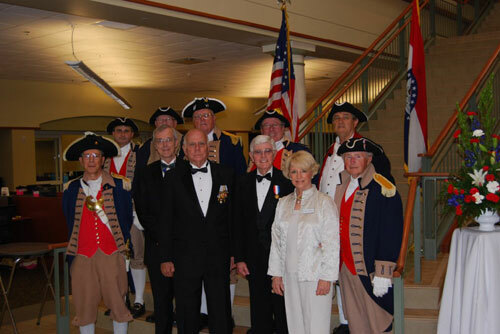 Left Photo - (Front Row)(L-R): Major General Robert L. Grover, MOSSAR Color Guard Commander; Gary Toms; Bill Gann; Claude Harkins, Inez Harkins, and Compatriot Al Paris. (2nd Row): Compatriot Dirk Stapleton, Compatriot Lyman Miller (KSSSAR); Compatriot Dewey Fry (KSSSAR), Compatriot James Scott, and Compatriot Jesse Lybarger. Photo taken by Compatriot Brain Smarker, Harry S. Truman Chapter Historian. 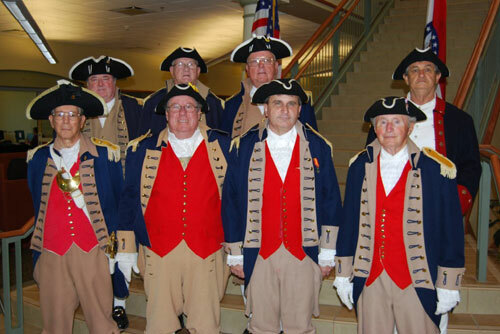 Right Photo - (Front Row)(L-R): Major General Robert L. Grover, MOSSAR Color Guard Commander; Compatriot James Scott; Compatriot Dirk Stapleton; and Compatriot Al Paris. (2nd Row): Compatriot Lyman Miller (KSSSAR); Compatriot Dewey Fry (KSSSAR), , and Compatriot Jesse Lybarger. Photo taken by Compatriot Brain Smarker, Harry S. Truman Chapter Historian.